If nodal supports should have an effect in certain directions only, you can define failure. 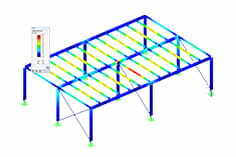 Here is an example of a single‑span beam, whose right support can only absorb positive vertical loads. The load comprises vertical suction load and horizontal load. The difference is illustrated in the graphic. 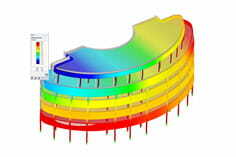 If there are additional horizontal forces after the vertical failure of the support with Option 1, the support with Option 2 fails completely. Therefore, it is necessary to select the proper nonlinearity according to the circumstances.